on your iPad & iPhone on-the-go! and it doesn't touch your data plan! Powerful, compact TV tuner connects easily to the dock connector port of an iPhone or iPad. Features a miniature telescopic antenna for convenient portability Alternative rod antenna included for enhanced reception at home or the office. 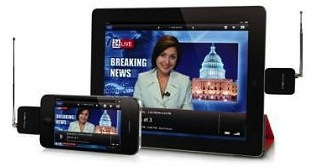 Watch live TV on your iPad and iPhone. Since the tuner technology uses special TV airwaves and is not streaming, you won't need an Internet connection, 3G/4G, or a Wi-Fi hotspot to watch TV. EyeTV never touches your data plan, so you can enjoy real live TV in brilliant quality without waiting for any data to load. EyeTV Mobile is the only TV tuner of its kind to offer flexible antenna options. Position the telescopic antenna for great reception on the go, or connect the rod antenna in areas with poor reception - you decide. The proven MCX connector always ensures optimal signal transmission and prevents damage to the TV tuner or iPad or iPhone. Dyle mobile TV is a service that gives EyeTV customers the ability to watch live, local broadcast television in select U.S. metropolitan areas. Dyle mobile TV is only available in those select metropolitan areas, and not all channels are available in all cities. See reception map to see if signals are available in your area. Dyle mobile TV service is currently available in the following markets: Atlanta, GA; Austin, TX; Birmingham, AL; Boston, MA; Charlotte, NC; Chicago, IL; Cincinnati, OH; Cleveland, OH; Columbus, OH; Dallas, TX; Dayton, OH; Denver, CO; Detroit, MI; Greenville, SC; Houston, TX; Kansas City, MO; Knoxville, TN; Las Vegas, NV; Los Angeles, CA; Miami, FL; Minneapolis, MN; Montgomery, AL; New York, NY; Orlando, FL; Philadelphia, PA; Phoenix, AZ; Portland, OR; Raleigh, NC; San Francisco, CA; Seattle, WA; St. Louis, MO; Tampa, FL; Tulsa, OK; Washington, DC; West Palm Beach, FL. Coverage may vary across participating markets and by zip code within a market. More stations and markets will continue to be added.